What is catechism? The term “catechism” is one that may well bring up images of a strange, outdated method of instruction. But catechizing has been a time-honored and effective practice throughout Protestant as well as Catholic history (though the catechisms of each obviously differ dramatically in content.) There are some very good reasons to consider using a catechism in teaching children, both at home and at church. 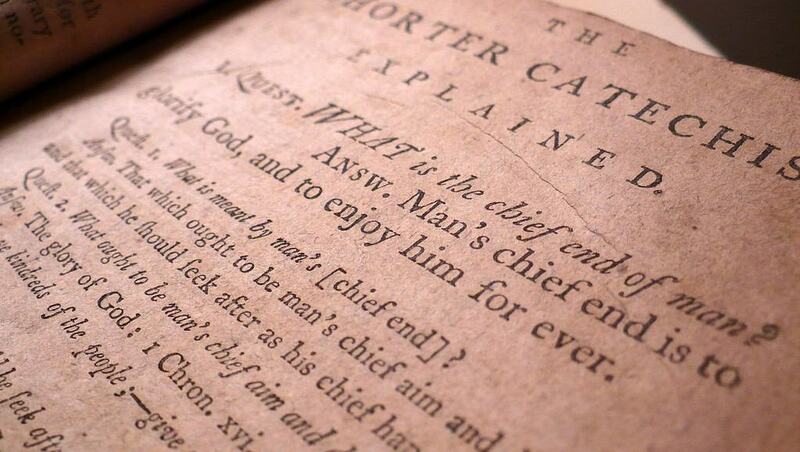 First, a little history and explanation of what a catechism is and does. For an example of an old-school catechism, you might want to check out my video clips from the Baptist Catechism set to music. Catechism comes from a Greek word used in the Bible, katacheo, that simply means “instructed” (Luke 1:4). Catechism is a question and answer method of instruction in basic Christian doctrines; it forms a framework for personal interaction with the Scriptures. The series of questions and answers develops a fundamental understanding of God, sin, salvation, prayer, the Bible, the church, and heaven and hell; each answer in the catechism is supported by Scripture references. Instruction in the catechism can often begin in a church simply by integrating it with current curriculum. If you’d like further information, see A Catechism for Boys and Girls online here, and the Shorter Catechism for younger children here. You can also download a wonderful Kids 4 Truth PowerPoint presentation, from which I quoted above, here. This is a little Q & A about catechisms that I wrote in the form in catechisms. I’m adding it here to Jeri’s excellent introduction to catechizing children. ~ Tony K.
Q: What is a catechism? A: A simple way to learn Bible truth. Q: In what does a catechism primarily consist? A: A catechism contains questions and short memorable answers. Q: How might a person instruct their family in right doctrine. A: The diligent use of a catechism. Q: Does the catechism method ensure right doctrine? A: No, only biblical answers ensure right doctrine. Q: Do all catechism teach Roman Catholic doctrine? A: No, many protestant catechisms have been written. Q: Are catechisms only for children? A: No, both young and old can benefit from orderly instruction. Q: Does the use of a catechism detract from the authority of Scripture? A: No, a good catechism will explain and uphold the Word of God. Q: Do catechisms make children bored? A: No, a wise teacher may use this form with great benefit for children. Q: Are catechisms educationally appropriate for modern children? A: Yes, the curiosity of an active mind is drawn to answer questions. Q: Will using a catechism cause my children to become Puritans? A: By the grace of the Lord, a catechism may convert one’s children. Q: What are the best catechisms? A: The Westminster Shorter Catechism and the Heidelberg Catechism are praiseworthy. Q: Do these teach the errors of the pedo batistss? Q: Can I learn the Baptist Catechism through song? A: Yes, the servant of God, Jim Orrick, has produced them on CD. Q: Are their any exceptional collections of catechism? Q: Where can a person learn more about catechisms? A: The internet has many resources. Wikipedia Article. Tim Challies on the Benefits of Catechisms. An Encouragement to the Use of Catechisms by Tom J. Nettles. James P. Boyce “A Brief Catechism of Bible Doctrine”. Tom J. Nettles A Catechism for Boys and Girls. Q: What catechism does Tony Kummer’s children learn. A: The Kummer children use the The Baptist Catechism , Big Truths for Little Thinkers, and A Catechism for Boys and Girls (preschool age catechism).